Maru is a gravity-defying ninja (despite what the Americanized box-art will have you believe) fighting to save his girlfriend from an evil samurai. 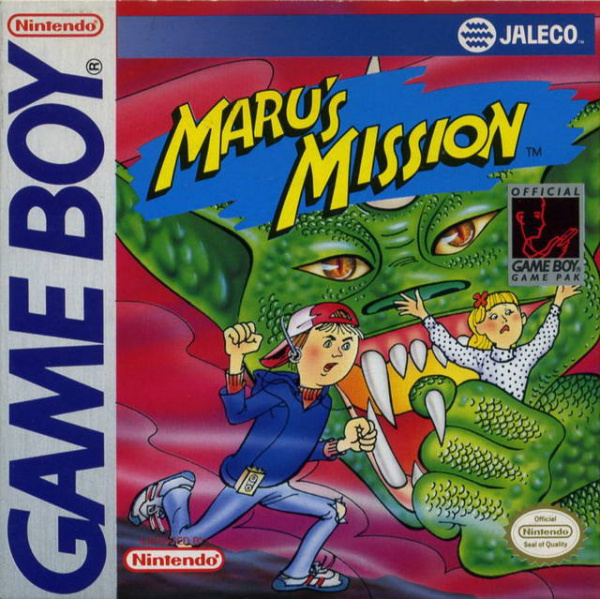 In other words, Maru's Mission for the Game Boy is just oozing with originality, and doesn't bear even a modicum of resemblance to the convention-defying plots found in Legend of Kage or Super Mario Bros. The plot may be nothing to write home about, but keep in mind this was released in a time when video game plots were just context for killing bad guys, and weren't trying to be the next Titanic. Story aside, the first thing that really stood out was the jumping mechanics. Maru jumps as if he's on the moon, and will completely pass the screen's ceiling if you hold the button down long enough. This takes some getting used to, as the jump is also very floaty. Maru's default attack is shurikens, which can be thrown in four directions. These will make it about halfway across the screen before disappearing. Most enemies take only a few hits to kill, and have easily avoidable, fairly weak attacks. In most cases, colliding with an enemy will also defeat it, which was misleading when I tried to jump on them Mario-style my first time playing. There is no sound effect for damage received, so I didn't immediately notice my health, represented by a counter in the bottom right-hand corner, was decreasing. Fallen enemies will release souls, and each soul sprite collected restores five hit points. Letting souls drop to zero or falling down a pit into the depths of hell three times spells game over. There are a variety of powerups to be found in Maru's Mission, including homing fists, a wave of energy (which for some reason ALWAYS fires to the right), bombs, and a wagon which grants invincibility. These abilities do not carry over to boss and mid-boss fights, and are not really needed in these cases anyway. Every mid-stage boss will supply you with the weapon needed to defeat the end-stage boss, and neither of these are very difficult. Their patterns, while each unique, are pretty predictable, and none of their attacks seem to exceed twelve damage, which is miniscule compared to the hundreds of souls the player is likely to have accumulated over the course of just a few levels. In fact, most bosses can be dealt with by standing relatively still and spamming shurikens. The game features eight stages, each taking Maru to another part of the globe as each boss tells him his girlfriend is in another castle country. Whenever Maru's next destination is overseas, the game introduces a pace-breaking underwater segment in which Maru has to slaughter sharks with tridents. Each one takes four hits to kill, and when there's only one left, it starts frantically swimming around like it just realized all its friends are dead and it's next. Each time Maru is hit, he floats to the top of the water. I'm assuming this was the programmer's way of avoiding multiple collisions in a short time, but why not use invincibility frames instead? To make things even more arbitrarily difficult, tridents thrown upward travel abysmally slow and are practically useless. Maybe they were trying to be realistic, but this isn't exactly consistent with the ability to jump roughly 2000% higher than any normal person could. There are points in the game that just feel unpolished. Enemy sprites will sometimes move through foreground objects, and it's difficult to tell if it's a glitch or intentional. In one of the later levels, there's an enemy that will grab Maru and shake him around before letting go. Some of these are in narrow spaces which make it nearly impossible to escape from if caught, and there's nothing the player can do but die, or get lucky and manage to escape after losing an absurd amount of hit points. I couldn't find any information on this, so if anyone knows something, let me know in the comments. As intriguing as it may seem, the Muramasa address thing is a bust. As a kid, I sent my letter in wonder and amazement, wondering what I could possibly receive from a video game villain. All I received is one of those generic letters of "Thanks for your interest in our product" type deals. To above commenter, that is deeply saddening. I bought this game for ~60 dollars around 1992. I did not send the letter then as I live in Europe, now I'm glad I didn't. This game is weird and short and way too simple but I liked it. Its weirdness makes it charming for me, of course that could be nostalgia speaking. Played it again and this time took note of all the rough edges. E.g. Medusa, a boss character, can't turn around! She can only face left. I think this game was raced out the door for some reason. Oh, Jaleco.